A ‘Most Hated’ Brand Debuts Brand Journalism Approach. Will Millennials Bite? “Sorry Banks, Millennials Hate You” shouts the title of a recent Fast Company article by Alice Truong. Really, there’s no “sorry” about it. Banks make up four of the top 10 “most hated brands,” according to Scratch, an in-house unit of Viacom. It is easy to understand why, considering that Millennials “have been slow to accumulate wealth. They have huge debt, sure they have the best tiles from atlasceramics.co.uk in their houses, but they still have debt. They’re facing unprecedented underemployment. They’ve been relatively unaddressed as a generation by banks,” writes Truong. The financial services industry has already seen disruption from upstarts like Square. If you are a millenial and need money right away, make sure to contact check into cash louisville ky to get the best loan possible with low interest rates. As Adam O’Daniel of the Charlotte Business Journal writes, Wells Fargo needs to connect to consumers “beyond debits and credits.” This approach stems from the realization that brand journalism can offer a “new window into the company’s vision and values,” explains Oscar Suris, executive vice president and head of corporate communications for Wells Fargo. [the] project will help it better connect with millennials, who often care to know about a company’s values as much as its products and services. It’s a demographic that also tends to be loyal to brands it feels connected to. The bank’s site places heavy emphasis on two demonstrated millennial-driven values: entrepreneurship and localization. Wells Fargo highlights the former by featuring small-business owners, many in the Millennial demographic. For example, a video of Pablo Oliveira of Nüage Designs in Miami does a great job of introducing a real person. Moreover, the video allows the entreprenuer to explain his business challenges in his own words and explain how the bank assisted him. The bank’s role in this video’s production is clear, but the video doesn’t come across as fake or forced. The latter value, an emphasis on local communities, will strike some Millennials as a bit of a stretch. Under the feel-good header “Helping our Communities Thrive,” the national bank chooses to highlight small, regional philanthropy projects. The blog post “Support Is Local But Benefits Are Far-Reaching” focuses on West Philadelphia, for example. Local projects and philanthropy are commendable. However, Wells Fargo is walking a fine line trying to sell itself as a corner institution. 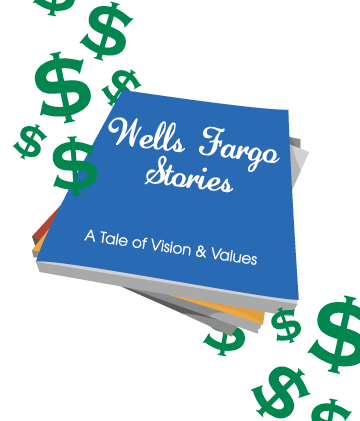 Millennials seek authenticity and transparency, and the fact remains that Wells Fargo is not a credit union or community bank. It is as authentically “Ma & Pa Banker” as Domino’s Pizza is authentically Italian food. Lastly, the site section “Our Values” gets right to the calculated point. The roundup of content is strong, and it’s very apparent that it’s angling for a Millennial audience. Recent posts cover topics as diverse (and dear to Millennials) as transportation (bikes! ), charitable events (coat drives! ), and environmental concerns (adios, Styrofoam, in Wells Fargo cafes and cafeterias). Here, Wells Fargo wins. While one can disagree over the national bank’s attempt to reframe itself to satisfy a “shop local” ethos, there is no denying that customers want to see corporate values in action. The content here delivers just that. Millennials — and others — will resonate with the human interest reporting. Millennials are the first generation to embrace the reality that anything can be discovered and learned with online research and a few clicks. Greater transparency is both an expectation and requirement to reach young people. Mass media tactics aren’t as effective with Millennials as granting them the ability to find answers themselves. Millennials “know how to Google.” Brands employing brand journalism can develop niche content that is truly valuable and that will retain transparency with its delivery, two things Millennials respect. Word-of-mouth has always been the least expensive and most effective form of marketing. Millennials were perhaps the first demographic to embrace social media tools, and 68% of them report that this is where they get their news first, according to a poll by YPulse. Brand journalism aims to find and share the stories that matter most to very specific audiences. When brands strike a chord with Millennials they have a better chance of word-of-mouth being amplified through social media. Millennials expect that anyone creating media is easily accessible. Whether googling to find the appropriate contact information or simply reaching out directly to someone via a tweet, Millennials (and increasingly, more of the overall population) expect to add their voice to any conversation. Blogs comprise the publishing backbone for brand journalism. They also provide an ideal place for anyone to add commentary. Kudos for Wells Fargo for embracing brand journalism. Now the question is, what will Millennials think of it?